I dont see how that switch could have caused any of your issues. Thats the one on the right side of machine. The mini doesnt home to that side at all. The only purpose of that switch is to stop the toolhead from hitting right side of machine if code has it move outside its travel limit. The mini homes to the rear left washer area. then travels to other spots. The only time it wont make it properly is if the steps/mm are off or theres some binding causes it not to move well. I first created a rough support structure to backstop the "extension" to the original, misdesigned Lulzbot part. Then I built a dam that extended the shape of the original part. Next I filled the dammed area and let it cure. Finally, I carefully hand filed the top (active) surface of the extension to be coplanar with the original part. If you compare this to the photos in the earlier post, you can see that the extension fills in the curved-off area in the original, misdesigned Lulzbot part that was causing the problem. In this next photo the switch has just barely been actuated. You can see that the switch has some overtravel - standard for microswitches like this. 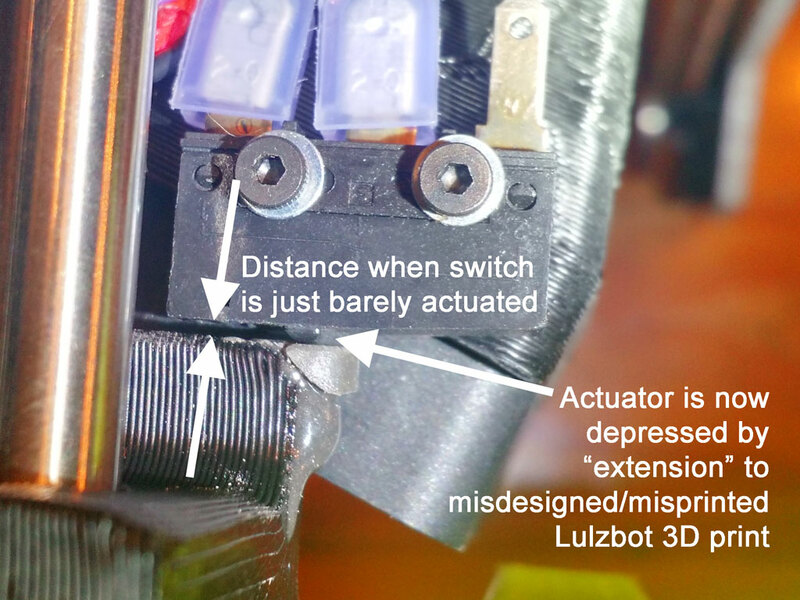 When fully depressed, the switch actuator is just barely below the surface of the switch body. This means something needs to absorb the force of the switch body hitting the original, misdesigned Lulzbot part in case the stepper doesn't stop fast enough. 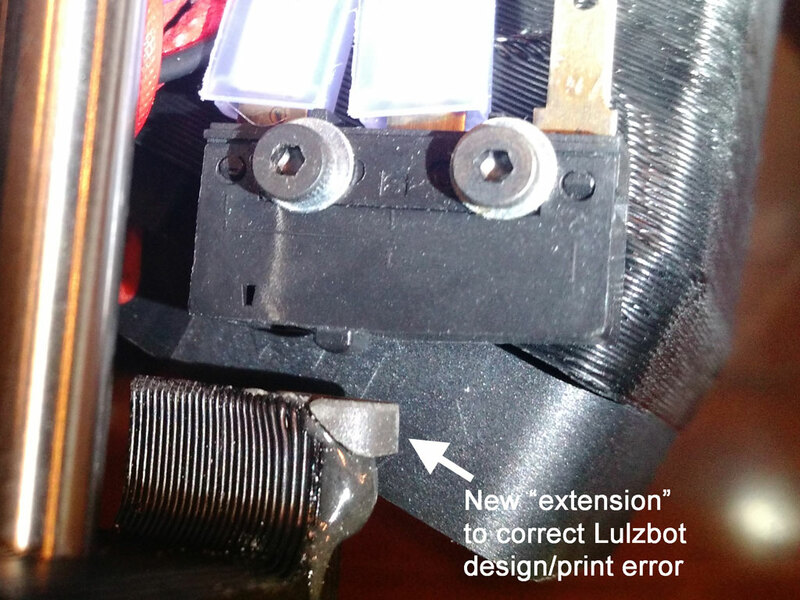 That's why I carefully filed the face of the new extension to be flat relative to the original Lulzbot part; if the carriage overtravels, you want the force to be taken by the original part, not the (somewhat cantilevered) extension. Now the switch body touches the original misdesigned Lulzbot part, the latter taking the force rather than the new extension. After taking these photos I reconnected the Mini and ran through a test self-leveling cycle without filament (due to the separate filament problem). Success! All four washers are now properly touched by the end of the nozzle. So it appears there are at least TWO possible causes for the Mini's failure to properly touch one or more washers. The first is the low-quality stepper motors whose shafts are subject to breakage, as documented in other threads herein. This second failure mechanism is this badly designed 3D part from Lulzbot. I'm not sure how this ever worked at all, but at least now we know what was wrong and how to fix it even if you only have one 3D printer available. Hope this helps someone... thanks! My mini is an early 1.03 unit. I would say it's been fairly reliable. -The early heat sink cooling was very inadequate. I believe the code for leveling "finds" the right side washers by using the switch. That's sure how it behaves, anyhow. Normally I would agree with you, that the switch only protects from over-extension due to bad GCode, but fixing it as shown instantly resolved the head positioning problems on the right side. YMMV. Update: Since repairing the right side switch stop as described above, and replacing the factory nozzle, the Mini is working - sort of. The dribbling problem at the start of each print is still a HUGE problem for this Lulzbot device, but once I get past that (manually) the prints themselves are fine. The way I'm solving the dribbling problem is to carefully watch the warmup just before the print starts, and as the head is lowered to the print bed grab the dribble with tweezers. This solves the "big blob" problem, but the first few inches of the "outline" are still spotty/choppy/peeling off the print bed. So I then hover with the tweezers and rip that off the table too, otherwise the nozzle will catch one of the taller strands and corrupt the entire print. It's exceedingly annoying that I have to sit there, tweezers in hand, playing peek-a-boo with a $1200 machine like this. And I don't know what will happen when I try to print a small object, where the "outline" is possibly so short that the filament flow won't stabilize before it starts the actual object. Seems like for $1200 you should get something a bit more reliable. The way I'm solving the dribbling problem is to carefully watch the warmup just before the print starts, and as the head is lowered to the print bed grab the dribble with tweezers. In my experience, excessive oozing is due to the nozzle temperature being too high. Try lowering it a few degrees at a time to see if that helps. Even when using the same type of material from the same manufacturer, I'll have to tweak the nozzle temperature a little bit when printing some colors. I don't have any experience with MakerGeeks, other than a week of excuses why they are unable to provide a MSDS for their "FDA Approved" material, but have read enough horror stories to stay away. Have you tried another brand? Can you post a picture of your skirt/first layer? I wonder if your Z offset is too high? Pictures will provide a lot of information. And I don't know what will happen when I try to print a small object, where the "outline" is possibly so short that the filament flow won't stabilize before it starts the actual object. I believe you use Cura, right? Go into the expert settings and increase your skirt line count. Seems like for $1200 you should get something a bit more reliable. I can only speak for myself, but my Mini has been great for the past 3 years. When getting ready to print, I always first wipe the bed and leveling washers, click print, walk away, and come back 6 hours later to remove the print. Don't forget to post pictures. In my experience, excessive oozing is due to the nozzle temperature being too high. Try lowering it a few degrees at a time to see if that helps. Yep, that was my theory too. I've lowered the temp a bit a time until it no longer adheres to the bed and interlayer adhesion is failing... it still dribbles. I wonder if your Z offset is too high? Again, I had the same thought. I've carefully adjusted the Z axis offset. I'm getting a nice, but not excessive, amount of "squish" on the first layer. I can post pictures if desired but I promise the Z axis offset is good. I didn't know that was exposed in Cura, but I just checked and there it is! I'll definitely bump that up. It will help insure the nozzle is fully primed before the real print starts. I believe that the dribbling/oozing problem allows the nozzle to evacuate a bit during the final warmup, which is why the skirt starts out intermittent. A definite Catch-22 problem, but your line count combined with my "quick hands" tearoff of the skirt will help. I always first wipe the bed and leveling washers, click print, walk away, and come back 6 hours later to remove the print. I too wipe the bed and washers before every print. AND, I carefully wipe the nozzle because I've found that the little cleaning strip doesn't always do the greatest job, even with brand new strips (I bought a big package of them with the Mini). I've basically become obsessive about making sure the Mini is spotless before and after every print. But cleanliness doesn't fix the dribbling problem... nor the -25C offset between what the thermistor reports and the reality measured by my calibrated Fluke thermometer. Sure wish there was a calibration parameter in Cura, or the Mini firmware (Merlin? ), for that like there is in every other thermistor equipped piece of equipment out there. Please post a video that shows the start up routine and beginning of the first layer of a problematic print. You can type descriptions of the problems endlessly and may never convey what we need to know to help determine what the problem actually is. Also, if you have not tried a different brand of filament, do that. I have not had good luck with makergeeks, if that is what you are using. Hatchbox is low cost filament that prints well and is easy to source. I suspect that will help, yes. Unfortunately I have a large stock of MakerGeeks filament but I do plan to get a sample spool of something else just to see if it makes a difference. 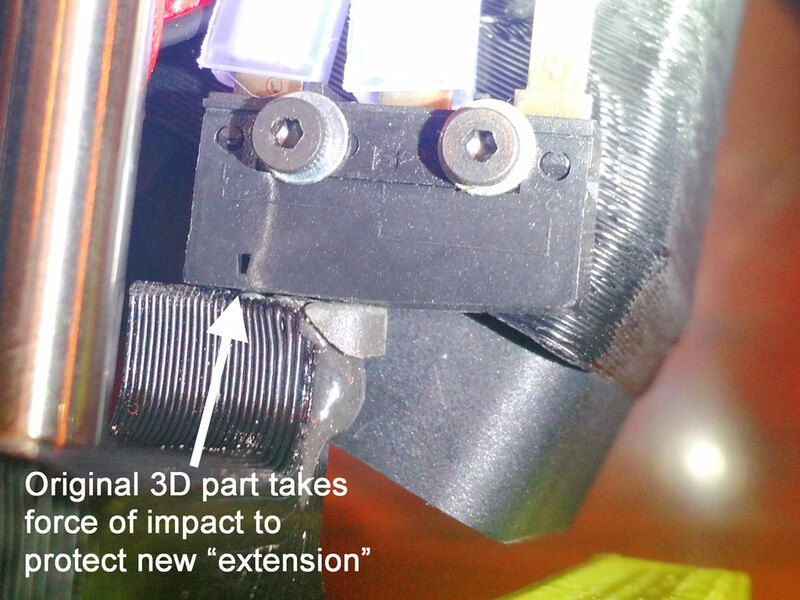 The filament cannot explain the misprinted switch part documented earlier, nor the strange nozzle behavior that caused the filament to spool off to the side (new aftermarket nozzle fixed that), etc. Lots of ghosts in a Lulzbot Mini, filament can only explain a few. We have a new Ender 3 coming in about a week that we are going to use for comparison.